National League Predictions: The NL is as closed off as it has ever been. The McCourts are turning the L.A. Dodgers into a reality show built for Hollywood. The Cubs & Mets are about as tired as their payrolls and fan bases. Till the phenom Steven Strasburg arrives in D.C., we don't have much to look forward to in the National League. Get After it . .
National League West Colorado Rockies. No shock here, winning the Wild Card a season ago, the Rockies aim to take the next step in 2010. While their bullpen may take time to come together, due to injuries to both Huston Street and Rafael Betancourt, the Rockies have a ton of talent to get them through. Starting right-handed pitcher Ubaldo Jimenez has shown strides in each of his first three full seasons. 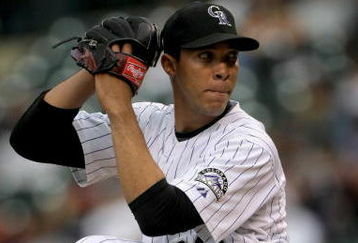 Jimenez improved in strikeouts and earned run average each year from 2007 through last season. Between 16-game winner Jorge De La Rosa and Jimenez, the Rockies have a solid one to punch in the NL West. The Rockies offense will lean heavily on of course the veteran Todd Helton but also young sluggers Brad Hawpe (23 HR's, .285) and Troy Tulowitzki (.297, 32 HR's). The core of this team is no joke, and they've been to a World Series, how soon we forget. National League Central St. Louis Cardinals. We said it on The Podcast, in last year's season preview, and we'll say it again this year, as long as Albert Pujols is a Cardinal, they've got a shot every season. While Albert is good for his 30 homers and 120+ RBI while hitting at a .330 clip every year, he isn't the only reason the Cardinals have been successful in recent years. After turning in career years last season, Cardinals starters Adam Wainwright and Chris Carpenter give St. Louis a great reason to expect big things this season as well. Both starters had earned run averages south of 2.70 and struck out over 140 batters. As for the Cardinals pen, closer Ryan Franklin is coming off the best season of his 10 years in the majors, a season which he saved 38 games in 44 chances. Yet pitching aside, it still comes back to Pujols. With a legitimate hitter behind him in Matt Holliday, the Cardinals slugger is going to see some pitches to swing at, and judging by Holliday's monster second half after being acquired by the Cardinals, they know exactly how to attack National League pitching. Stay healthy, the Cardinals will win 90+. National League East Philadelphia Phillies. Back to back World Series appearances, and now they add the games best pitcher? 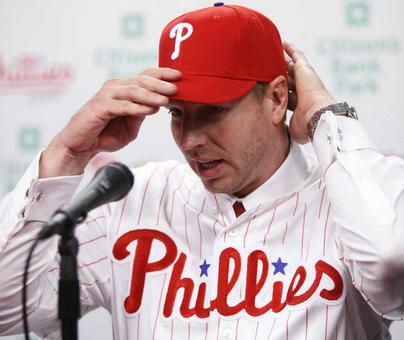 When Philadelphia added Roy Halladay this offseason, a pitcher who notched 37 wins over the past two seasons, the National League got real scared. For a pitcher whose been pitching in the American League East over the past 12 years, the National League is going to make Doc feel like he died and went to heaven. The City of Brotherly Love went from a laughing stock runner-up franchise to the best franchise in the National League very quickly. Between Chase Utley, Ryan Howard, a ton of depth, the Phillies look just as good as they have each of the last two seasons. Hoping that Cole Hamels can return to the form he was two seasons ago, the Phillies will trot out two big-time starting aces who can compete with any staff in both leagues. National League Wild Card Atlanta Braves. 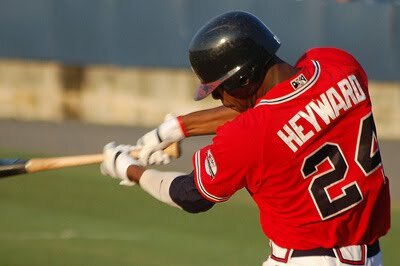 The Braves are about as much of a sleeper as their highly hyped 20-year old rookie center fielder, Jason Heyward. Who does legendary Braves manager Bobby Cox compare to Heyward to? Try Hank "F******" Aaron! Everyone in the organization is raving about this kid, to the point that Cox claims Heyward is so good that his rookie season will do more than make an impact on this team. Aside from the excitement surrounding Heyward, the Braves are led by the veteran Chipper Jones who is looking to send Bobby Cox out with one last run on the Braves bench. Brian McCann, Nate McLouth, and Martin Prado are about to lead the Atlanta Braves on a deep run this season toward a playoff spot. If Tim Hudson's Spring Training display is a sign of things to come, the Braves may not even miss 15-game winner a season ago, Javier Vasquez whose now a Yankee, again. National League MVP Albert Pujols. Why pick anyone else? Pujols will have another monster year in which he puts up mind bending stats. He gets a full season with Matt Holliday in his lineup, the same Matt Holliday who came over in a trade and watched his OPS rise nearly .200 in the jump from the AL to NL. An MVP in 2010 would be his third straight and fourth in six years. Safe bet. National League Cy Young Roy Halladay. Is it as easy as saying Halladay's jump from the rough and tumble American League East to the National League will result in 5-10 more victories? Maybe. However, I'm going to say that Halladay has been waiting to be on a contender for a long time and he's the type of bulldog pitcher who will show up in a big way. Make no bones about it, Roy Halladay is the best pitcher in the game.